How to spin the blade on z axis? I'm very new in Adobe After Effects and I'd like to spin my blade to the direction on the (z axis) as shown in the picture below. Can anyone pls give me some hints how to achieve this effect? Re: How to spin the blade on z axis? 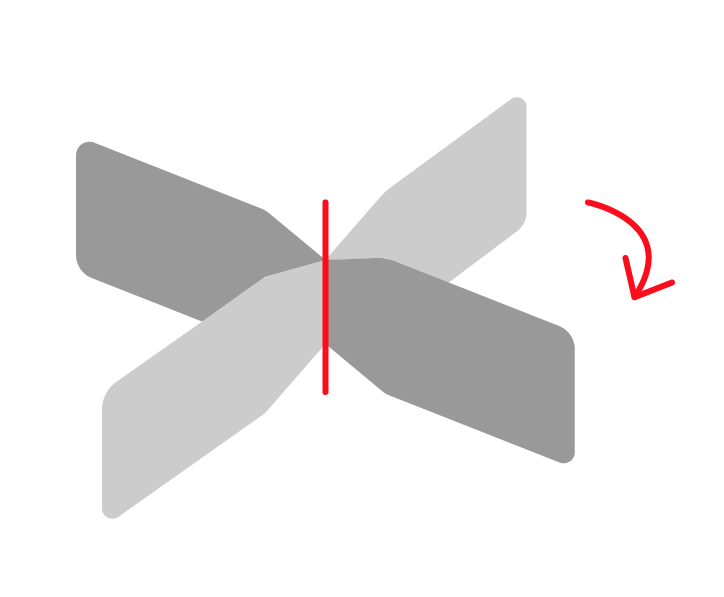 1º: Draw the shape of one blade as if viewed from the front. 4º: Link the blade(shape) to the null layer. 5º: Either rotate them to the desired position or create a camera and position the camera. 6º: Duplicate the shape 3 times and unparent these three. 7º: Rotate the null 90º in X, relink one shape, repeat 7º for the remaining two shapes. Its a lot easier if you create a camera and position that instead of rotating the null, because you'll avoid any gimbal rotation issues. And with a camera, you can also remove most of the perspective you'll have if you just use the default camera view angle of ~35º. So it will look more like your example.